A murder case, the Supreme Court, and the one-way ratchet of settler colonial law converge in Oklahoma. The Supreme Court heard oral arguments in the case Carpenter v. Murphy on November 27. At issue in the case is whether the roadside ditch in rural Oklahoma where Patrick Murphy murdered George Jacobs is part of the Muscogee Creek Reservation. If the murder took place on the Muscogee Creek Reservation, it would fall under federal jurisdiction. If it was not Indian land, then the state of Oklahoma would have jurisdiction. A tenth circuit court ruling found that the land fit the Supreme Court’s criteria to be considered a reservation. 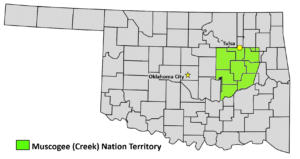 If the Supreme Court decides that the tenth circuit is right, then they would have to accept that half of Oklahoma—lands guaranteed to the Cherokee, Creek, Choctaw, Chickasaw, and Seminole Nations by treaty—are in fact Indian Country. If the Supreme Court decides that the tenth circuit is wrong, it would establish the contemptuous treatment of Indian nations as settled law. Paraphrasing this argument, we do not need to know precisely when the state of Oklahoma overran Creek territory and abolished Creek government; we only need to know that it happened. One problem with this argument is that the Muscogee Creek Government has neither been abolished nor relinquished its claim to this territory. As the tenth circuit ruling notes, “Congress never dissolved the Creek government; it has enjoyed continuous and uninterrupted existence.” The Muscogee Creek Nation has a legislature, executive, and courts, and provides services, including law enforcement. The broader problem with these arguments is that they depend on the logic of adverse possession. Adverse possession, or “squatters rights,” applies to situations in which one party gains title to a piece of property based on their history of occupation even if they do not hold the deed to it. In some cases, adverse possession allows poor people to claim title to land that they own and farm. In other cases, violence or wealth is used to take possession of land, and adverse possession is used to title it. In either case, adverse possession insists that the legal status must be made to conform to the situation on the ground rather than the other way around. If the federal government, the state of Oklahoma, and the people who live in the territory act as though the state and the municipality have jurisdiction, and if they act that way for long enough, then such action in and of itself constitutes a legal justification for the state’s jurisdiction. As legal scholar Garret Epps puts it, “contemptuous treatment of the tribe by the state and federal government after allotment makes a formal statute unnecessary.” In other words, might makes right. As if to make this clear, Lisa Blatt, who is representing the state of Oklahoma, analogized this history of contemptuous treatment to the sacking of Rome to argue that the state does not have to establish a specific moment in which Congress disestablished the Muscogee Creek Reservation. “Rome did not fall in a day. We know it fell by 476 [CE], but it was sacked several times before that.” Her intent was to show that sometimes history does not provide orderly transitions, precise dates, and clear legal records. In doing so, however, she cast the state of Oklahoma and the United States Congress as lawless barbarian hordes who sacked Rome. This comparison is perhaps more apt than she would like to admit. If the Supreme Court rules that the Muscogee Creek Reservation has been dissolved even in the absence of a formal statute by Congress, it would, in effect, provide an after-the-fact legal legitimacy to the sacking of the Muscogee Creek Nation. But it would do more than simply provide a fig leaf of cover for the contemptuous treatment of the Muscogee Creek Nation. It would fix that contempt as a permanent, legal standard and the baseline for future legal rulings. It would act, in effect, as the catch on a one-way ratchet. If the Court rules that disregard for tribal sovereignty is legal and makes it permanent, the catch slips into place, and the process begins again from a new status quo. As a slave holder and a taker of Indian land, Washington managed to pursue both sources of wealth that was created by oppression of Africans and Native Americans. It has always seemed to me that the plan was for the new nation to sweep across the place that US people call “American” and to take it all. Treaties with Indians are a lot like the promises that Trump makes to people who work for him. They were intended to be false and to be broken any time. This country still has many people who think that breaking promises is the right way. It will be sad if the court decides that people who steal land can keep it because they have gotten used to being on and benefiting from other people’s land, and it might mess up their lives if they have to give it back. The message has always been clear as to whose lives they cared about. I had an ancestor who is said to have become a Quaker, freed his slaves, and moved to Ohio. The slave-freeing story seems absurd. In Ohio he shifted his mode of oppression by killing Indians instead of owning slaves He also became governor of the new territory. Like many people with famous ancestors, my grandmother’s people over-estimated how close they were to this famous man (in generations)and how virtuous he was. There is an excellent exhibit on treaties running at the National Museum of the American Indian in Washington DC. The argument of the exhibit is that, while treaties (and especially the later treaties) were made with ill intent, they have nevertheless afforded native communities a means by which to force the US to recognize their existence, and that this has had the unintended consequence of helping them to maintain themselves as vibrant and living communities. It’s worth having a look, if you get the chance. And remarkable to be standing face to face with the original documents.